(GBR) More than humbled to be opening the second day of the fantastic Shift Happens : ALT Shift conference here in Pilot Theatre, York (the exact same thing I did last year). 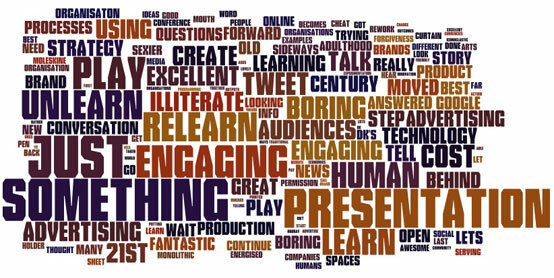 This year my aim to explore power, engagement and play in the context of social media use. DK is an inspirational speaker, his presentations are always geared to his audience, and he knows how to generate a real buzz in the room. Most of all he knows his stuff, presents it brilliantly and is able to convey thoughts, ideas to enable true understanding. He has delivered keynotes at our last 2 shift happens events and he totally rocked the crowd. Thanks DK I have learned a lot from you and your presentations. Plus here’s another interview from KhaozMediaYork—listen here. UPDATE—check out the video of the keynote here. I am not at Shift Happens but pleased to hear a distinctly human element introduced to the tech innovation debate (judging from the noises on Twitter). Would like to read more. Great intro to social media DK. Excellent IKEA case study – Certainly think it’s time for the cultural sector to turn its inherent creativity to the opportunities presented by what are essentially the paintbrushes of the digital age. Excellent content and delivery in your session today. You managed to make the Big Bad World of social Media fun, easy and inviting. Thanks for reminder of importance of play in learning and also for all the new information and help. was really inpired by your session today. have come home now and still not shut off my brain from all the thoughts and ideas that are spining around in there. all i could think while i listened to you was – I want DK to work with my company. I thought your presentation yesterday was brilliant and dealt with the question of “Why use social media?” really well. I particularly liked your response that sometimes forgiveness is easier to ask for than permission re: one of the questions at the end. It did make me wonder a bit about how we (especially those working in the public sector/local government) go about introducing the use of social media into their work places and overcoming the fear that their superiors may have about it – any tips/ideas? Looking forward to what you come back with at Shift next year and finding out what part 3 in the making social media work for you saga is. [DK] forced me to reveiw my digistories profile on Twitter. I have now added my name to the profile – not just in the biog, and my face to the plain text digistories logo. I was impressed with a lot of other things you said too – provocative and stimulating. Thank you. re: your question Kim – it’s about focussing on the benefit and value any social media operation brings. The fear is good – means they are asking the right questions but remember it should not mean they are not willing to try new things. If after all that they’re still not open to it, time to look for another place to work maybe? Thanks for the response to my question – that’s actually very helpful and I may take that list of questions and work them into my notes somewhere for reporting back to my organisation. I’m hoping (possibly a little optimistically) that it won’t come to that final ultimatum, but we’ll see as it’s been an on-going uphill struggle to get any kind of social media engagement going here. Apologies for the late response (unforgivable), but I currently work part-time in local government (a District Council) and am trying to get the SMT to embrace some aspects of social media *beyond* an arbitary twitter presence and flickr account. By using these highly visual bite-size films I hope we can get some actual commitment to allowing employees time to have a play, and then report back on why and how they should/will use social media to improve their service area. Obviously I agree with DK in what he says, the frustration is that we *know* social media can and will enable efficiency savings and improve services in a new decade of cuts, but I guess the best you can do is get them engaged, then follow up with a (business) plan that doesn’t cost much, and has some shortish-term metrics! I’ll let you know how I get on and good luck to you too.